The Paignton and Dartmouth Steam Railway (P&DSR) have sold prairie tank 4588 to a private owner. The locomotive has moved to Tyseley Locomotive Works, where its overhaul will commence. Once overhauled, 4588 will move on to Peak Rail. The P&DSR have been looking to sell this small prairie tank since 2008, mainly (it seems) due to the weight of the line’s tourist laden trains needing more powerful locomotives. 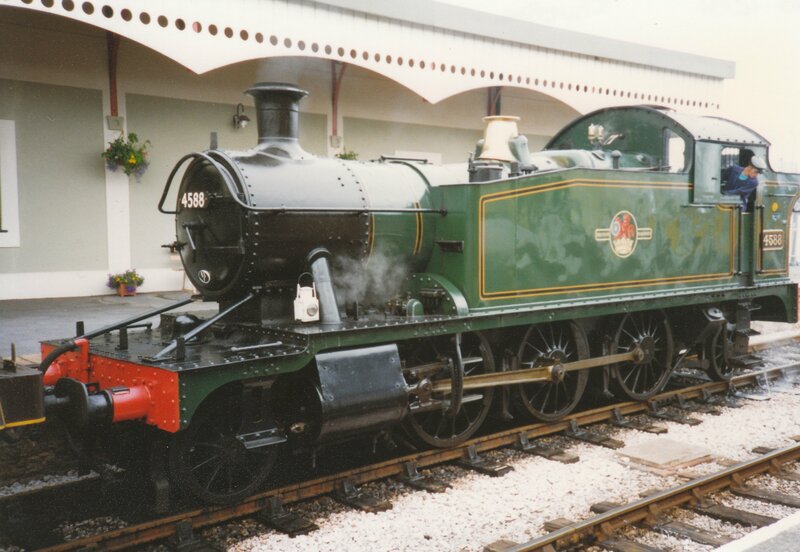 I have many fond memories of seeing this locomotive in action during holidays to Devon when I was younger. Although it is sad to see it depart, at least its new owners intend to get it steaming again. Whether it will keep its spurious name (Trojan) is not clear. Meanwhile the P&DSR continues work on the overhaul of BR Standard 4MT 4-6-0 75014 (named Braveheart – click here for update.) If all goes to plan, 75014 will be running by the end of 2015, when work will commence on overhauling small prairie tank 4555. 4555 will be useful for lighter off-peak trains, whilst the heavy GWR 2-8-0T’s, Manor and BR Standard Class for peak running. So it’s all change for 4575 class 4588. Let’s look forward to it running in its new home – Peak Rail! 05/02/2015 in News - Preserved Railway, Paignton & Dartmouth. It would be nice if it comes to the GWSR… 😀 There’s quite a number of GWSR updates but not all of them are in the public domain yet, so I best keep shtum for a bit! Now that sounds intriguing! Looking forward to hearing more!